FACT: Businesses that innovate through digitalisation experience increases in productivity, engagement and revenue opportunities, as well as experience drops in operational expenditure. I’m sure you will agree that these are some pretty amazing figures, but did you know the benefits of digitalisation do not stop here. Staff and customer engagement and loyalty have been known to increase, workplaces become safer and tasks are undertaken more efficiently, when information becomes faster and more accessible. So, what is holding you back from transforming your business with digital forms? Designed for any businesses on the go, our form and report formats and functionality offer limitless possibilities. Simply drag and drop your desired component onto the preview frame for instant form creation. It’s so easy to become a Form Rockstar. Is there additional training required to use my forms? Send supplementary forms via branching. How can I make real time decisions from the collected data? Bring your data to life through data analytics, all accessible from your personalised dashboard. Digital forms allow for data standardisation, which in turns lets you to analyse trends, identify business risks and opportunities, make informed real time decisions and develop business strategies. Can I have complete control from one platform? Absolutely. 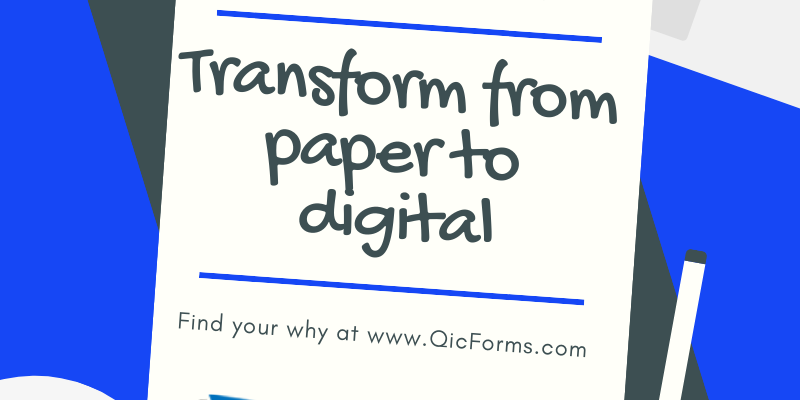 QicForms offers visibility, validation and version control all at your fingertips. Access all your data any time, anywhere from your cloud based management system. and bank/government grade secure servers keeping your data safe. So I have all this data. What’s next? It doesn’t stop at data collection! Distribute your data through secure API integration or seamlessly post to your forms direct to your storage provider. Share your data between users, departments or other software applications with ease. It’s time to make your forms work for you.